Disney is always coming up with new ways to enthral its guests. 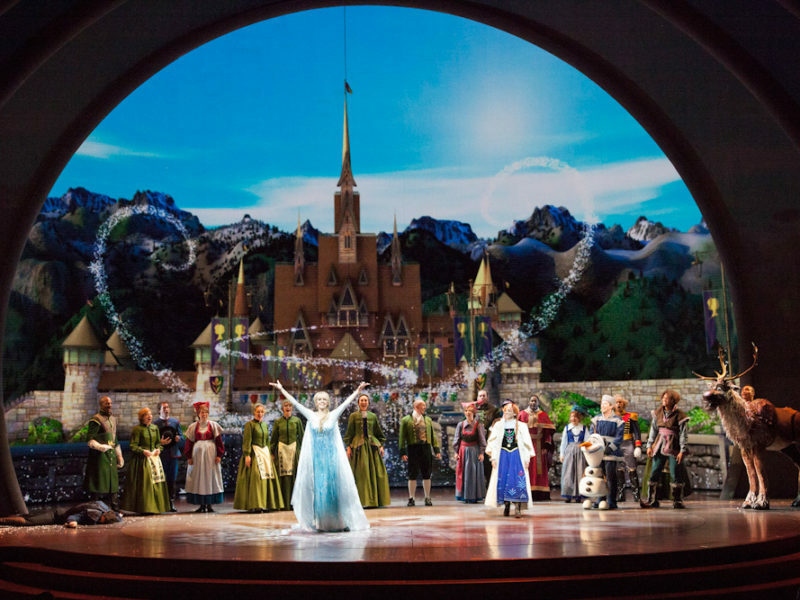 After nearly two years of planning and construction, Epcot at Walt Disney World Resort in Florida has transported Anna, Elsa and Olaf from Arendelle to mesmerise Frozen fans. Frozen Ever After will whisk them away for an on-the-water journey, all to a soundtrack of their favourite songs from Frozen, of course. The boat ride begins on the docks of Arendelle. After finding a seat aboard one of the boats, the lapping waters take guests into the wintery willow forest. A landscape of ‘boulders’ then springs to life, morphing into Kristoff’s family from Troll Valley. Then it’s time for the crowning glory of the journey, with the boats floating into the icy blue world of the North Mountain, Queen Elsa’s enchanting ice palace. It is here that the now iconic rousing refrains of Let It Go fill the dark. Finally, guests get to hang on tight as they glide back down into the Bay of Arendelle for the final spectacle, complete with characters and more music. 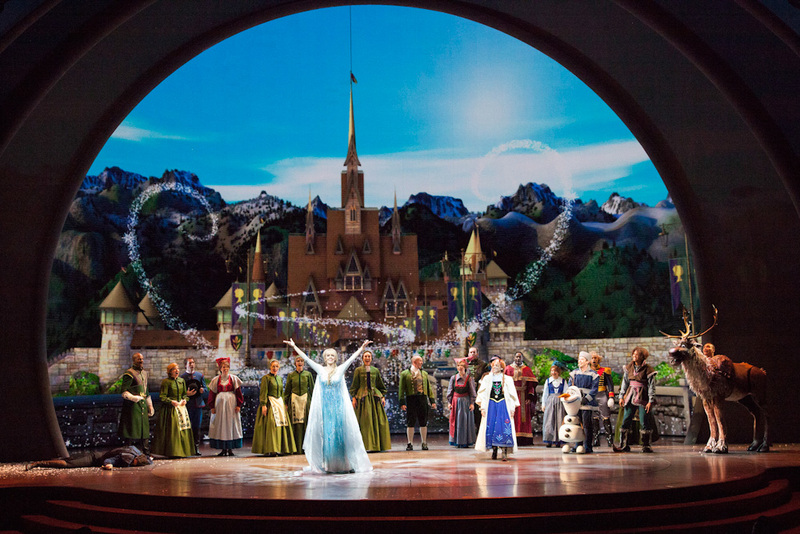 And because too much Frozen is never enough, once back on dry land don’t miss the chance for more Anna and Elsa and music at the live show, Frozen: Live at the Hyperion, only at Disney California Adventure Park at Disneyland Resort in California. A 55-minute Broadway-style musical, the facts and figures are staggering: more than 2500 actors/singers and 100 dancers auditioned for the production; more than 1000 costumes were created for the show, including 772 pairs of shoes; the chandelier in Elsa’s Ice Palace has more than 500 points of light; it took nearly 4180 square-metres of custom-dyed fabric to create the Aurora curtain that almost completely surrounds the audience inside the theatre. Nestled between towering spires of rock, this thriving port contains a seemingly familiar architecture of markets, landing zones and buildings. The ground has officially broken on two new Star Wars-themed lands coming to both Disneyland Resort in California and Walt Disney World Resort in Florida. The special displays and irresistible behind-the-scenes access to Star Wars: The Force Awakens at Star Wars Launch Bay, give devotees spectacular sights, sounds and surprises. There are replica props, models, costumes and artefacts from the Star Wars films and behind-the-scenes videos about how a new generation of filmmakers is crafting the future of the epic saga with Chewbacca on hand for a furry embrace. You can have a new adventure every time on Star Tours – The Adventures Continue (the story twists are random, so you never know where in the galaxy you’ll go). You can travel through hyperspace into the middle of a starship battle above Coruscant, or plunge into the oceans of Naboo and try to avoid the clutches of monstrous fish. Fans will also love getting inside the Death Star to escape Darth Vader and take on Boba Fett. Star Wars: A Galactic Spectacular combines state-of-the-art projection effects, dynamic lighting, lasers and pyrotechnics with John Williams’s goose bump-inducing music and lots of characters. During the show you get to gaze upon Tatooine’s famous twin suns, fight through an army of battle droids, rocket down the Death Star’s narrow trench and deliver a heroic final blow to Starkiller Base.